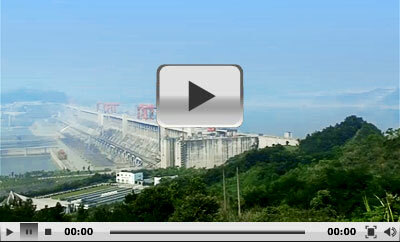 "Three Gorges Dam Project" is the short term for the water control project on Yangtze River. It is located in the middle section of Xiling Gorge near Sandouping Town in Yichang City, Hubei Province. Being the world's largest hydropower project, this dam has created many "Firsts" such as the most efficient dam in flood control, the most difficult construction work and the largest migration project in the world. The dam project is composed of the dam, the hydropower stations and the navigation facility. It measures 607 feet tall and the top is 3,319 yards wide. It has taken 17 years to finish the construction of the whole project, which started in 1992 and includes three stages. The first stage took five years from 1992 to 1997. During this period, the cofferdam construction and the excavation of a diversion channel in the first stage were finished. Meanwhile, a temporary ship lock on the left bank of the river and some preparation work was also completed. The second stage lasted six years from 1998 to 2003, when the cofferdam construction was in its second stage and was undertaken at the same time as the construction of the permanent ship lock and the navigation buildings. The power station facilities construction and the installation of machinery on the left bank were also completed. The third stage of the project began in 2003 and has been completed in 2009. During this period, the installation of all machinery, the construction of the power station and the dam on the right bank are finished. Now, a 3,861 square miles canyon-reservoir dam is presented to the world. The dam project was born with a huge controversy covering economic, technical, environment, migration, tourism and the protection fields. Great concerns have been paid regarding the benefits and problems that this century's big project would bring to the people and the environment. The adoption of the project construction resolution ended the heated debates among scientists. The landscape along the Three Gorges is like a traditional Chinese picture, and the precious cultural relics ranging from the Paleolithic Age to the modern times add a human touch to the area. It is always a hot spot on travelers' itinerary. But as the water rising, many scenery and historical sites were or will be flooded (by the change of the water level).The relevant cultural relic department and local government are doing their best to save these valuable cultural treasures. The protection methods such as removal and reproduction are adopted. Moreover, the rising water also increases the scenic area, making some impenetrable streams and scenic sights easy to reach. In a word, the dam project has ruined much natural beauty but at the same time creates new ones. So visitors should explore more, not just to feel pity of it. Opened in 1997, the Dam Scenic Area is mainly composed of Tanzi Mountain, 185 Platform, Dam Viewing Point and Memorial Garden. It fully displays to visitors the culture of the water conservancy project. Climbing on the Viewing Platform, visitors will have a panoramic view of the whole dam. 185 Platform got the name from its height – 185 meters, equivalent to the height of the dam crest. Standing on the Dam Viewing Point, visitors will see the huge dam body at close range. The Memorial Garden is a large open air museum where exhibits a large number of machines that have been used in the dam construction, such as mechanical excavators and cranes. Besides, visitors can also go to Huangling Temple, the largest ancient building in the Three Gorges area. 1. Take bus no.4, 10, 10-1, 21, 34, 100, or 101 in Yichang City and get off at Yemingzhu Station, take bus no. 8 in the dam area and get off at Liuzhashou Tourist Reception Center and take the minibus to visit the dam area. 2. Take bus no.3, 4, 9, 21 or 100 and get off at Dongshan Dadao (opposite to Pinghu Hotel), and take tour bus to get there. 3. At Sanxia Airport, take shuttle bus to Yichang Long-distance Bus Station. Walk northwards along Dongshan Avenue for 3-5 minutes to Yiling Square bus stop. Take bus no. 10 to Yemingzhu and transfer to Special Line 8 to the scenic area. Free, but visitors need to pay CNY 35 for the sightseeing bus in the scenic area. is there any cruise from wuhan to the three gorges dam ? As I know, there are only Yichang - Chongqing or Chonqing - Yichang cruises. How long does it take in total from the Yichang airport to the Three Gorges Dam Project? And are the buses frequent? You need to take a shuttle bus from the airport to Yichang Bus Station and then take bus line 809-2 to the scenic area. It takes about 2 hours in total and yes, the buses are frequent. Do you need to get tickets of Three Gorges Dam Project in advance? Yes, you need to book tickets in advance because of the limited tourists into the scenic area. You can take the train from Zhangjiajie to Three Gorges Dam, which is the most convenient way. How long does it take to get from Yichang city to the Dam by the bus routes suggested above? It may take about 40 minutes to get there. Can you tell the address where to buy the night cruise tickets?